Our Customers Love Us… And They Want You To Know It. Read Glowing Reviews From Some Of Our Customers Who Needed Windows & Doors Near Naperville. Have you worked with Dilworth? We’d love to hear from you. CLICK HERE to leave your review. “The experience my wife and I had with Jerry Dilworth and his team was outstanding. It was the type of service you would expect from anyone, regardless of the type of product or service you are purchasing, but all too often something falls short of making it positive start-to-finish. From the initial conversation I had with the salesman, through the installation and final follow-up for warranty registration, Dilworth Windows & Doors delivered 100% satisfaction along the way. The salesman was very professional, not pushy and never came across like he wanted to sell me something I didn't really want. He asked a lot of good questions about our preferences before coming out to our home. He arrived on time for our late Friday afternoon appointment. He was patient with all the questions my wife and I had and spent nearly 3 hours working with us on the best combination of color schemes, door choices and decorative glass options. We had two other company's come out to provide an estimate and although they were professional, neither took the time to help design our perfect entryway. The experience with the others was more like, "we can do whatever you want". We wanted (and needed) someone with creative thinking and that's what we got with Dilworth. In addition to our great reviews and references, we have an “A+” rating with the Better Business Bureau and an “A” with Angie’s List. If that sounds like the kind of window and door company you’re looking for, contact us today. We would enjoy discussing your project with you. 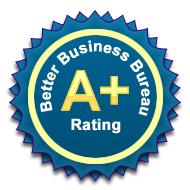 In addition to our great reviews and references, we have an “A+” rating with the Better Business Bureau and an “A” with Angie’s List. We’re also just one of only three companies (out of 32!) with a 100% “Superior” rating in Consumers’ CHECKBOOK, and boast the second-highest rating in the “Doing Work Properly” and “Starting & Completing Work Promptly” categories in all of Chicagoland. If that sounds like the kind of window and door company you’re looking for, contact us today. We would enjoy discussing your project with you.